I am using #03 Apricot. I have pale skin with warm undertones and I look good in corals and oranges but not with cool pinks. First, the color was right for me. The perfect, moderate orange without looking too bold. Also, it doesn't feel sticky and it's perfect for daily use. As a tint, even when it fades, the color stays on, and perfect when I know I can't touch up my makeup during the day. The durability is so-so but even when it fades, the color is still there so I give 5★. I would love to try the other shades. It's very pigmented so it only takes one layer. The color is still there even after a meal so I just apply some gloss after I eat. It does feel a little drying, but it doesn't start peeling and I just need to reapply lip gloss for the perfect long lasting shade. Using #05 Coral Pink. Orange pink shade that is more on the pink side. It's called the "bride's lip" and it makes me happy just using it. I think it overall creates a very soft, cute impression. I am using #03 Apricot. Orange pink color that's on the orange side. It's not too cute and I can wear this for work. I like how it matched my skin (cool undertone). I would definitely keep on using this shade. This is the perfect, pigmented, long lasting, easy to retouch lip product. I was in doubt since the reviews were almost "too good" but I ended up buying the Red. It's a sheer red with gloss and is very pretty. It looks healthy for young girls and for older people like me. If you like a sheer red, this is the perfect shade for you. But, I think the best part about this lip is that it fades in a very pretty way. It doesn't come off all at once. It's not drying. The color and gloss lasts pretty good. And, this price. Cheap ... I would buy this even if this was double the current price. For a "tint" it might not be long lasting, but it just keeps the lips looking very pretty. I think this is a very well-balanced product. Perfect for everyday use! I have 2 shades, 02 Pink and 05 Coral Pink ☆ The Pink is a blue based stronger pink and it brightens up my face ♪ The Coral Pink is perfect for work! It's not too much on my lips, and its the right amount of pigmentation. 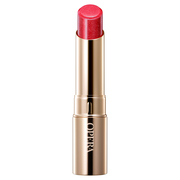 It glides on my lips, and as a tint, it stays and shows really well on my lips! If I don't have that much time during the day to re-apply, I use Rimmel's lip coat on top.